Our seats are covered by a preservation order and are being lovingly restored. Please help us with the project! We have sat on them and been charmed, touched, riveted, sometimes annoyed. Now the seating is being overhauled. Be part of the project and support us in the loving restoration of our listed-status seats. 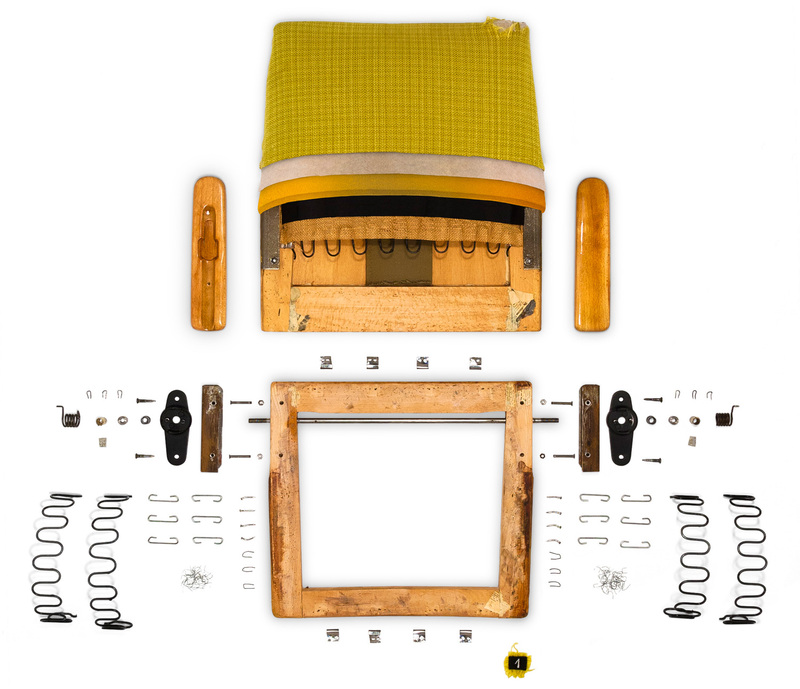 A chair is made up of a hundred different components, each with its role to play in holding the whole construction together. Our seats were designed by the architect of the opera house, Fritz Bornemann, and are an important part of the building’s 1960s aesthetic. The corn yellow of the upholstery is key to the look that audiences are familiar with today. The visual impact of the seating and its functionality dovetail harmoniously with the architecture of the auditorium and the building as a whole. The Deutsche Oper Berlin as an ensemble is a listed structure and the seating is included under the preservation order. In the same way that our repertoire is constantly being tweaked and renewed, our seats, too, are now due for an overhaul - in a way that conserves their originality and history. This will involve the painstaking work of professionals and you can support us in this lovingly executed restoration project. Each contribution goes towards the beautification of our seating. Many thanks for your assistance. We look forward with you to the new seats. Like to back the seating project with a minimum contribution of € 3.00? When buying tickets at the box office, over the telephone or from our online shop, simply round up the bill accordingly. We will give you a “Mein Stück Deutsche Oper Berlin” sticker as a ‘thank you’. Want to support the refurbishment project with € 50.00? You can give a donation when buying tickets at the box office, over the telephone or from the online shop when choosing items. It goes without saying that we will provide you with a tax receipt if you require one. In return for your donation we hope you will be among our invited guests at the concert for sponsors. Your name will also be added to our roll of donors and we will throw in a cloth marked “Ihr Stück Deutsche Oper Berlin” for keeping your cell phone clean. Prefer to back the restoration of the seats with a contribution of € 250.00? You can give a donation when buying tickets at the box office, over the telephone or from the online shop when choosing items. It goes without saying that we will provide you with a tax receipt if you require one. In return for your donation we hope you will be among our invited guests at the concert for sponsors. Your name will also be added to our roll of donors and as a sign of our gratitude and to commemorate your gift we will present you with a certificate [15 x 21 cm] stating the original chair number. Like to support the project with a contribution of € 500.00? You can give a donation when buying tickets at the box office, over the telephone or from the online shop when choosing items. It goes without saying that we will provide you with a tax receipt if you require one. In return for your donation we hope you will be among our invited guests at the concert for sponsors. Your name will also be added to our roll of donors. A plaque with your name on will be fixed to one of the renovated seats in the auditorium and remain there for five years. You will also receive a framed certificate [15 x 21 cm] with a section of the original fabric as a memento of your donation. Like to support the project with a contribution of € 1,000.00? You can give a donation when buying tickets at the box office, over the telephone or from the online shop when choosing items. It goes without saying that we will provide you with a tax receipt if you require one. In return for your donation we hope you will be among our invited guests at the concert for sponsors. Your name will also be added to our roll of donors. A plaque with your name on will be fixed to one of the renovated seats in the auditorium and remain there in perpetuity. As a memento of your donation you will also receive a framed certificate [21 x 30 cm] with an appliqué of the original fabric. Like to support our seating project but our donation categories don’t suit your life and budget? Feel free to bolster our restoration work with a contribution of your choice. Our Tickets Office can advise you; please contact the staff by email at info@deutscheoperberlin.de or by phone on +49 (30) 343 84 343. In return for your donation your name will be added to our roll of donors and we hope you will be among our invited guests at the concert for sponsors. The other items (certificates, plaques, etc) are determined by the value of the donation. Select an amount to donate when choosing an item in our online shop or download our information brochure (incl. remittance slip) as a PDF file. For donations of € 50.00 or more you will be sent a receipt automatically (on request also for smaller donations).